Does Pilot Training Need to Change? Do We Need to Change the Way Pilots Are Trained? Do We Need to Change the Way Pilots Are Trained? 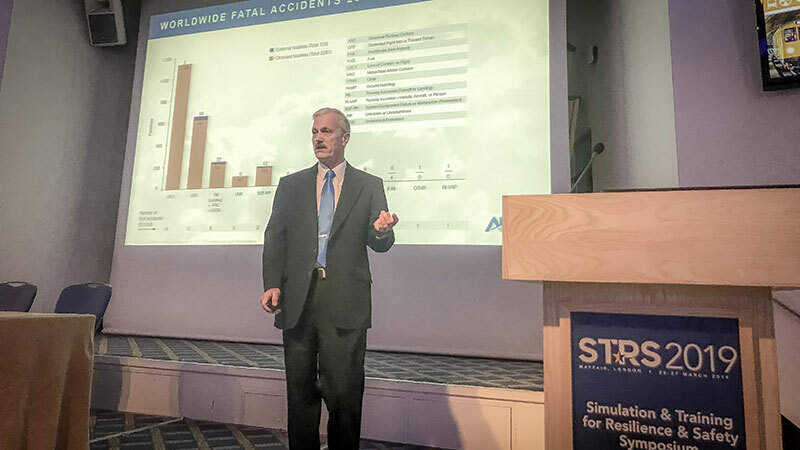 The 2019 inaugural Simulation & Training for Resilience & Safety Symposium, held at the headquarters of the Royal Aeronautical Society in London, addressed training and simulation across safety-critical industries. Randy Brooks, APS VP of Training and Business Development, delivered a presentation: “Upset Prevention and Recovery Training (UPRT): Combining Reality and Simulation for Optimum Results.” Additionally, he attended other presentations addressing safety in training specifically regarding the advantages and disadvantages of using simulation in training. The following event recap discusses aviation-related presentations from STRS as well as general thoughts about the value of the conference for safety conscious industries. In Randy’s presentation, he discussed the fundamental importance of both on-aircraft and simulation in Upset Prevention and Recovery Training (UPRT), a critical component of pilot training that is not yet mandated by most sectors of aviation. Randy covered the proper methods of combining academics, all-attitude aircraft, and flight simulation to provide the most effective UPRT. “By describing how on-aircraft training can fill the human factors and aerodynamic gaps of flight simulators, I hope that those in other industries can see how they can combine different instructional platforms to achieve the best results in their fields,” said Brooks. Dr. Shawn Pruchnicki, Faculty Member, The Center for Aviation Studies, The Ohio State University & Dr. Kathy Abbott, Chief Scientific and Technical Advisor for Flight Deck Human Factors, Federal Aviation Administration presented on training for events which have no prescribed procedures to follow. Their study advocated four contributors to resiliency: Anticipation, Monitoring, Responding and Learning. UPRT is a specific subset of events which have no prescribed procedures to follow; the variables involved in upset events are nearly limitless. In the question and answer session following their presentation, Randy explained that UPRT at APS is aligned with those four factors, but instead of Learning (capturing lessons learned by debriefing following an incident) occurring after the fact, the Learning component must come first based on the time-critical nature of upset events. The rest of the contributing components of resilient behaviors well describe the training conducted by APS, and Brooks explained the flexible nature of the strategic response adopted and implemented by APS which provides versatility in combating a wide variety of upset situations. Learning from others is what keeps us at the state of the art for emerging concepts and technologies. Where safety is concerned, it is important that we constantly innovate to improve the effectiveness of our training. Presenters discussing simulation, training practices and technology from the fields of medicine, virtual/augmented reality, human factors, academic research, and military applications provided new and thought provoking possibilities of how to improve resilience through training. This synergistic work among training leaders promotes improvement and safety across all industries and allows insights and advancements that would not be as efficiently obtained working within our industries alone.